Living in the country sure is hard work. In this pleasent country scene a family does their best to try and scare away the Pheasents who have descended upon their pumpkin patch. However they were unsuccessful. 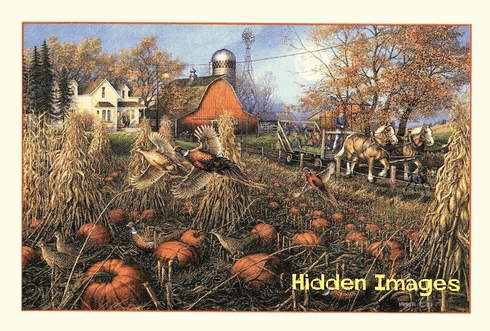 Find out what happens in this 1000 piece puzzle. The puzzle measures 19"x30". This puzzle is Eco-Friendly and printed with Soy-Based Inks on Recycled Board. Proudly made in the USA.